Background: In accordance with the Uniform Determination of Death Act, guidelines for brain death determination are developed at an institutional level, potentially leading to variability of practice. We evaluated the differences in brain death guidelines in major US hospitals with a strong presence of neurology and neurosurgery to determine whether there was evidence of variation from the guidelines as put forth by the American Academy of Neurology (AAN). Methods: We requested the guidelines for determination of death by brain criteria from the US News and World Report top 50 neurology/neurosurgery institutions in 2006. We evaluated the guidelines for five categories of data: guideline performance, preclinical testing, clinical examination, apnea testing, and ancillary tests. We compared the guidelines directly with the AAN guidelines for consistencies/differences. Results: There was an 82% response rate to requests. Major discrepancies were present among institutions for all five categories. Variability existed in the guidelines' requirements for performance of the evaluation, prerequisites prior to testing, specifics of the brainstem examination and apnea testing, and what types of ancillary tests could be performed, including what pitfalls or limitations might exist. Conclusions: Major differences exist in brain death guidelines among the leading neurologic hospitals in the Unites States. Adherence to the American Academy of Neurology guidelines is variable. If the guidelines reflect actual practice at each institution, there are substantial differences in practice which may have consequences for the determination of death and initiation of transplant procedures. In 1959, Mollaret and Goulon1 described 23 patients with irreversible coma, in what became the birth of the concept of brain death. Subsequently, neurologists and hospital boards sought to create specific definitions of this new entity, in which there was irreversible loss of the function of the entire brain, but the systemic organs were still supported by artificial means. The impact of such definitions was far reaching, as the President's Commission in 19812 established the equality of this concept of death with conventional definitions that required the cessation of function of the heart and lungs as well. This had profound medical, ethical, and legal ramifications, helping to provide finality for families unclear about prognosis, to preserve vital intensive care unit (ICU) resources, and to allow for more widespread and successful organ donation. A unique feature of the determination of death by brain criteria is that, according to the Universal Determination of Death Act, physicians are required to determine death in accordance with accepted medical standards, which can be national, regional, or local. This allows for broad leeway for physicians practicing at different institutions to create and abide by protocols for brain death determination that may be widely disparate. The determination is often at the discretion of the individual physician, which is fundamentally different from other countries that specify exactly what to test. Despite the fact that the American Academy of Neurology (AAN) published practice parameters for the determination of brain death in adults in 1995,3 it has been noted that there is still a great variety of practice in US hospitals.4 This may provide confusion for physicians, other healthcare workers, and the general public, and may undermine the implicit mandate to have guidelines fulfill a legal definition of death. We sought to assess this variability of practice of brain death determination at US medical institutions with a strong presence of neurology or neurosurgery. Our aim was to discern, among these reputable institutions, where differences in the guidelines of brain death determination existed, in order to provide insight to how these differences might impact the delivery of care, or introduce confusion to the general understanding of the concept of brain death. We approached the top 50 neurology and neurosurgery programs in 2006, according to US News and World Report, which produces a list of such categories on a yearly basis. We solicited these programs by sending a personal e-mail to neurologists or neurosurgeons at each institution, asking for a copy of their institution's guidelines. If there was no response, a second e-mail was sent, either to the original physician or to another physician at that institution. In some cases, a follow-up phone call was placed, or physicians were approached in person. The delivery of the institutional guidelines was entirely at the discretion of the physician at each institution, and all were provided assurance that the statistics from individual institutions would remain anonymous, as the purpose of the study was to provide summary statistics across all the responding institutions. We accepted only the official guidelines from each hospital. As the study involved no patients, and the guidelines were not considered private property, it was not necessary to seek approval from an institutional review board. We separated the responses into five different categories for analysis: guideline performance, preclinical testing, clinical examination, apnea testing, and ancillary tests. We used this framework to create summary statistics regarding the variability or commonality of practice among the responding institutions. Of the 50 programs solicited, there were 41 responders (82% response rate). Three institutions did not have specific guidelines, leaving 38 for evaluation. There was marked variability in the performance of different aspects of the guidelines, including the number of examinations required, the types of physicians who could perform the examinations, and the waiting periods between examinations (figure 1). Institutions varied widely regarding who could perform brain death determination at their institution. Options included an intensivist, the patient's primary attending, a neurologist or neurosurgeon, or no stipulation. 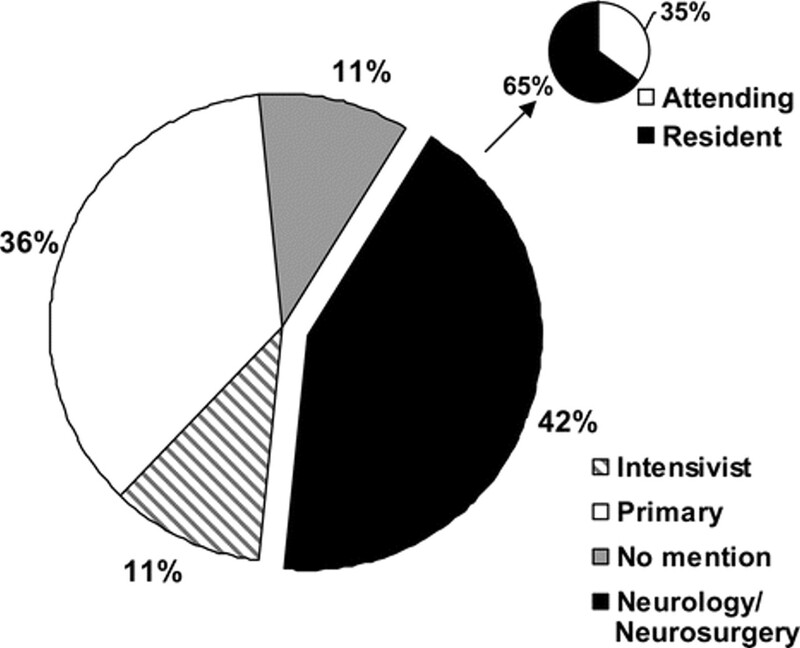 A neurologist or neurosurgeon was required to be involved in only 42% of guidelines, and of these, only 35% required that an attending neurologist or neurosurgeon be involved. Multiple examinations were required in 71% of guidelines, and 3% required greater than two. Forty-four percent stipulated that two separate physicians perform the examination, rather than the same physician twice. Some (3%) guidelines permitted the omission of one of the two clinical examinations if neuroimaging was consistent with a neurologic catastrophe. For institutions that did require multiple examinations, the time required between examinations varied widely, from 1 to 24 hours. The most commonly stipulated waiting period was 6 hours (80%), but this interval could be shortened if there was supportive ancillary testing (14%), or lengthened for children (24%), for patients with brain death of unknown cause (10%), or for patients with a non-structural cause (5%). Sixteen percent mentioned a specific waiting period for cardiac arrest patients, but the waiting period varied from 24 hours (66%) to 12 or 6 hours (17% for each). Stratification by different age groups was stipulated in 45% of guidelines, and variable numbers of age groups were specified, including 2 (35%), 3 (12%), 4 (29%), and 5 (24%). Fifty-three percent simply specified that the patient be an adult, but did not specify an age cutoff. Prerequisites prior to clinical testing were specified in the great majority of guidelines (97%), but individual prerequisites varied widely from the AAN guidelines (figure 2). Areas with greatest variation included establishing an underlying cause and ensuring the absence of sedatives/paralytics, acid-base disorders, or endocrine disorders. Many centers did not adhere strictly to the American Academy of Neurology guidelines in regard to preclinical testing. Notably poor compliance occurred in establishing a cause, as well as ensuring the absence of sedatives and paralytics, severe acid-base disorders, or endocrine disorders, all of which might potentially influence the clinical examination. 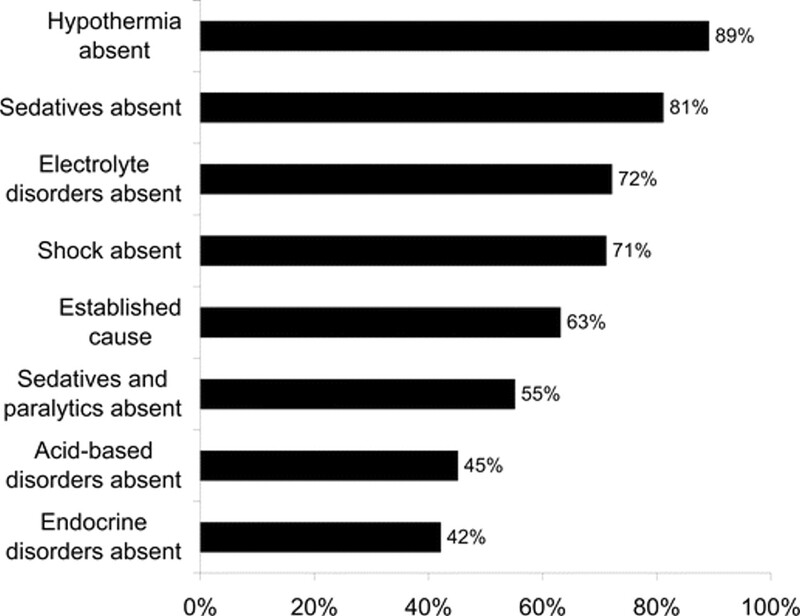 Patients were commonly required to not be hypothermic (89%), but 11 different minimum temperatures were mentioned across the country: 32.0 °C, 32.2 °C, or 90.0 °F was mentioned in the majority (74%); other temperatures that were mentioned include 35 °C (6%), 36 °C (6%), 36.5 °C (6%), 35.5 to 36.5 °C (3%), 97 °F (6%), and 96.5 °F (3%). An absence of shock was required in the majority (71%), but the definition of shock varied widely, and 24% of guidelines did not specify an acceptable blood pressure. The most commonly specified was a systolic blood pressure (SBP) ≥90 mm Hg (45%), but others mentioned included an SBP >80 mm Hg (6%) or 100 mm Hg (3%), a mean arterial pressure >55 mm Hg (12%), an SBP no less than 10 mm Hg below the patient's baseline (3%), within 20% of the baseline (3%), and “normal blood pressure for age” (3%). In only one guideline was an apnea test not required. All guidelines mandated the presence of coma. Specific brainstem testing is shown in figure 3. Areas of particular deviation from the AAN guidelines include testing for pain above the foramen magnum, the oculocephalic reflex, the jaw jerk reflex, and establishing absence of spontaneous respirations. In general, there was good compliance with American Academy of Neurology guidelines regarding the clinical examination. Notably poor compliance occurred in the testing of pain above the foramen magnum and the jaw jerk, as well as documenting an absence of spontaneous respirations. OCR = oculocephalic reflex; OVR = oculovestibular reflex. Apnea testing was a specific source of variations of technique (figure 4). A specific lowest acceptable temperature for apnea testing was required in 26%, and that temperature varied from 36.5 °C (70%) to 35 °C (10%) and 32 °C (20%). Only 66% of guidelines specified that an arterial blood gas (ABG) be drawn prior to testing, and a normal pCO2 level was specified in only 39%. Preoxygenation was mandatory in 76%, but the method was unclear in 69%. Other areas of particular deviation include the use of supplemental oxygen during the test, the acceptable final values for pCO2, reasons to stop the test due to instability, and how and when to repeat the test if inconclusive. Relatively poor compliance with American Academy of Neurology guidelines was seen in the category of apnea testing. Discrepancies occurred in the performance of the testing, the values to be obtained, and the procedures in case of instability or inconclusiveness. The variation in guidelines regarding ancillary testing is shown in tables 1 and 2. Specific situations in which to procure ancillary testing were mentioned in 66% of guidelines. These situations included inability to complete the clinical examination (74%), toxic drug levels (56%), inconclusive apnea testing (44%), normal neuroimaging (16%), and chronic CO2 retention (32%). Common ancillary tests, including angiography, radionuclide scintigraphy, and electroencephalography, were frequently mentioned, but the specific details of these tests were given much less commonly. Although there is nearly uniform acceptance of brain death as a concept and a legal entity, we found wide variability in the practice and determination of brain death among the US News and World Report top 50 institutions for neurology and neurosurgery. This variability applied across all five categories examined. Although there were some areas of strong consistency among the guidelines, there were some striking and unexpected areas of discrepancy. In the category of guideline performance, there was a surprisingly low rate of involvement of neurologists or neurosurgeons in the determination. Furthermore, the requirement that an attending physician be involved in the determination require was conspicuously uncommon. Given a technique with some complexity as well as potential medical-legal implications, we found it surprising that more institutions did not require a higher level or more specific area of expertise. Perhaps this reflected a manpower issue at individual institutions, or the lack of availability of neurologists or neurosurgeons on a 24-hour basis. Alternatively, many institutions may feel that intensivists or others can accurately perform the brain death assessment with proper training, and it may not be necessary to have a neurologist or neurosurgeon present. Multiple separate examinations were commonly mandated, and the time periods varied widely. This may reflect a need to ensure a level of confidence that the determination was done correctly. Regarding preclinical testing, it was surprising to find that the cause of brain death was not stipulated in a large number of guidelines. Although an absence of drug intoxication was commonly mentioned, specific drugs varied widely. Hypothermia and hypotension were commonly mentioned, but the spectrum of temperatures and blood pressures mentioned was profound. Confounding medical conditions, such as electrolyte, acid-base, or endocrine disorders, are known to influence the neurologic examination, and were commonly mentioned. However, all three were mentioned in the same guideline uncommonly. The area with the highest degree of consistency with the AAN guidelines was the clinical examination, as most guidelines specifically mentioned aspects of the coma and brainstem examination. 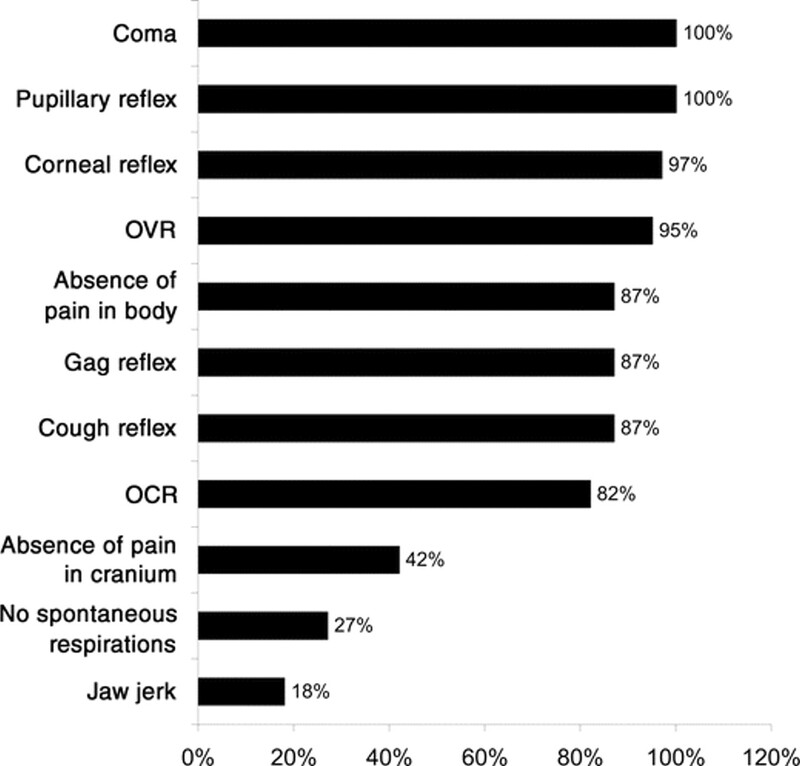 Notable deviations were in the testing of pain above the foramen magnum, the jaw jerk reflex, and surprisingly the absence of spontaneous respirations. Perhaps this was felt to be implicit if apnea testing was a natural evolution of the evaluation, but specifically documenting absent spontaneous respirations would make the transition to apnea testing appear more clear and appropriate. Of concern was the variability in the apnea testing, an area with the greatest possibility for inaccuracies, indeterminate testing, and potentially even danger to the patient.5 This included variability for temperature, drawing of an ABG prior to testing, the proper baseline pCO2, and technique for performing the test. 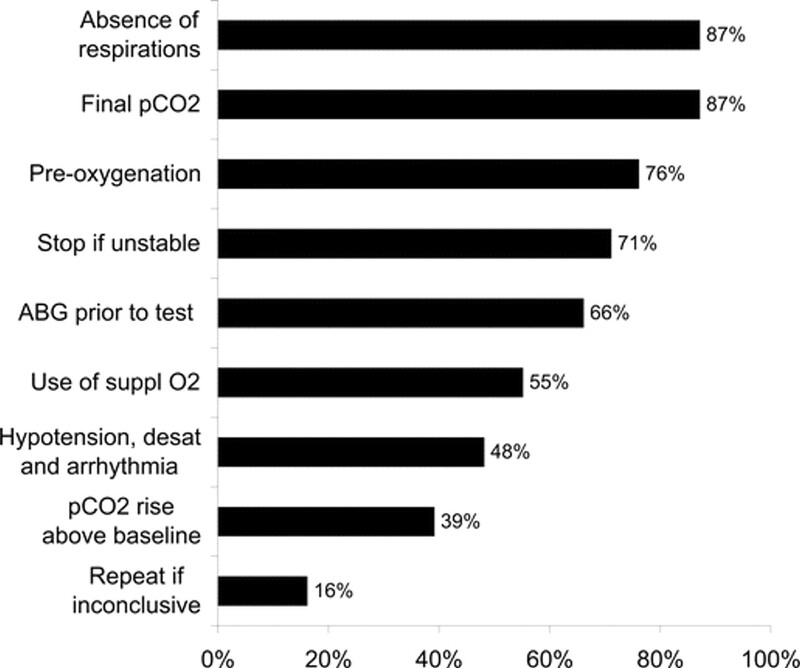 Although a final pCO2 level was commonly stated (most often 60 mm Hg), specific guidelines in a situation of chronic CO2 retention, clinical instability, or inconclusive testing were commonly lacking. A surprising number (13%) of guidelines did not specify that spontaneous respirations be absent during the apnea test. Ancillary testing was not exempt from variability. EEG, conventional angiography, and radionuclide scintigraphy were the most commonly stated techniques, but the specifics for performing such testing were frequently absent. The proper determination of these and other confirmatory tests has been stipulated by review committees,6–8 and unless specifically stated in local guidelines, the concern could be raised for possible incorrect performance. Although the reliability of somatosensory evoked potentials has been drawn into question, they remain an acceptable technique in a large number of guidelines. Finally, promising tests such as CT angiography, CT perfusion, and MR angiography have permeated some of the guidelines, but these tests, although interesting,9,10 have shown questionable value in comparison to conventional angiography (the gold standard),11 and have not been validated or recommended by a governing committee to our knowledge. The findings from this study provide a current assessment of what is being done at some of the most prominent neurologic and neurosurgical hospitals in the United States. As brain death guidelines are commonly devised on the local level by neurologists and neurosurgeons, this may give an indication of what general practice is among these institutions, although adherence to guidelines at the hospital or physician level was not assessed in this study. The high response rate (82%) to our request for guidelines is also encouraging, helping to lower the possibility of bias due to inadequate sampling. Although we were pleased to have an accurate representation of brain death determination in the prominent US neurologic institutions in this study, we found the results at once interesting and disturbing. Given the variability of practice in North America4,12 and the world,13 the accuracy of assessment for brain death across institutions, and even among individual physicians, may be drawn into question. This has important ethical as well as medical-legal implications, since brain death is considered a legal definition of death, and inappropriately labeling a patient as dead by brain criteria could subject them to inappropriate treatment, including withdrawal of care in theoretical circumstances.14 A similar variability of brain death determination guidelines in children has been noted as well, including the improper performance of apnea testing and the use of ancillary testing.15 Given the fact that the guidelines put forth by the AAN are now 13 years old, perhaps now is the time that they be rewritten, with an emphasis on a higher degree of specific detail in areas in which there is greater variability of practice. Furthermore, perhaps now there should be standards by which individual institutions are held more accountable for their closeness to, or variability from, national guidelines. This may help to provide more accurate diagnoses in the future, assisting in the preservation of ICU resources, the process of organ donation, and implications from a medical-legal standpoint. Participating centers include the following: Abbott Northwestern Hospital, Baptist St. Anthony's Health System, Barnes-Jewish Hospital, Baylor Health Care System, Brigham and Women's Hospital, Cedars-Sinai Medical Center, The Cleveland Clinic, Columbia University Medical Center, Florida Hospital, Harper University Hospital, Henry Ford Hospital, Johns Hopkins Hospital, Massachusetts General Hospital, Mayo Clinic, Methodist Hospital System (Houston), Northwestern Memorial Hospital, Rush-Copley Medical Center, Rush-Presbyterian Hospital, St. Joseph's Hospital (Phoenix), Stanford University Medical Center, Strong Memorial Hospital, The Ohio State University Medical Center, The University Hospital (Cincinnati), University Hospitals of Cleveland, University Medical Center (Tucson), University of Alabama Birmingham Health System, University of California Los Angeles Medical Center, University of California San Francisco Medical Center, University of Colorado Hospital, Shands Teaching Hospital University of Florida, University of Miami School of Medicine, University of Michigan Medical Center, University of Minnesota Medical Center, Hospital of the University of Pennsylvania, University of Pittsburgh Medical Center, University of Southern California Affiliated Hospitals, University of Virginia Health System, University of Washington Medical Center, William Beaumont Hospital. e-Pub ahead of print on December 12, 2007, at www.neurology.org. Disclosure: Dr. Greer reports receiving speaker honoraria from Boehringer-Ingelheim Pharmaceuticals, Inc. Drs. Varelas reports being a speaker for UCB-Pharma and a consultant for Codman, and an advisor for the Medicines Company. Drs. Haque and Wijdicks report no conflicts of interest. Received July 6, 2007. Accepted in final form October 1, 2007. Mollaret P, Goulon M. Le coma dépassé. Rev Neurol (Paris) 1959;101:3–15. Guidelines for the determination of death. Report of the medical consultants on the diagnosis of death to the President's Commission for the Study of Ethical Problems in Medicine and Biomedical and Behavioral Research. JAMA 1981;246:2184–2186. Practice parameters for determining brain death in adults (summary statement). Report of the Quality Standards Subcommittee of the American Academy of Neurology. Neurology 1995;45:1012–1014. Powner DJ, Hernandez M, Rives TE. Variability among hospital policies for determining brain death in adults. Crit Care Med 2004;32:1284–1288. Goudreau JL, Wijdicks EFM, Emery SF. Complications during apnea testing in the determination of brain death: Predisposing factors. Neurology 2000;55:1045–1048. American Encephalographic Society. Guideline three: minimum technical standards for EEG recording in suspected cerebral death. J Clin Neurophysiol 1994;11:10–13. Munari M, Zucchetta P, Carollo C, et al. Confirmatory tests in the diagnosis of brain death: Comparison between SPECT and contrast angiography. Crit Care Med 2005;33:2068–2073. Ducrocq X, Hassler W, Moritake K, et al. Consensus opinion on diagnosis of cerebral circulatory arrest using Doppler-sonography. Task Force Group on cerebral death of the Neurosonology Research Group of the World Federation of Neurology. J Neurol Sci 1998;159:145–150. Qureshi AI, Kirmani JF, Xavier AR, Siddiqui AM. Computed tomographic angiography for diagnosis of brain death. Neurology 2004;62:652–653. Lövblad K-O, Bassetti C. Diffusion-weighted magnetic resonance imaging in brain death. Stroke 2000;31:539–542. Combes J-C, Chomel A, Ricolfi F, d'Athis P, Freysz M. Reliability of computed tomographic angiography in the diagnosis of brain death. Transplant Proc 2007;39:16–20. Hornby K, Shemie SD, Teitelbaum J, Doig C. Variability in hospital-based brain death guidelines in Canada. Can J Anaesth 2006;53:613–619. Wijdicks EFM. Brain death worldwide: accepted fact but no global consensus in diagnostic criteria. Neurology 2002;58:20–25. Van Norman GA. A matter of life and death: what every anesthesiologist should know about the medical, legal and ethical aspects of declaring brain death. Anesthesiology 1999;91:275–287. Mejia RE, Pollack MM. Variability in brain death determination practices in children. JAMA 1995;274:550–553. How can we achieve uniformity in brain death determinations?